to its present location in Spokane, WA. Tradition takes the Order of Carmel back nine centuries before Christ to the time of the Prophet Elias who is considered its Founder. Saint Elias lived as a hermit on Mount Carmel in Palestine, which also became a place of solitude for his disciples. During a long drought, he climbed to the summit of Carmel in order to beg God’s help for his people. At his prayer, a little cloud was seen rising up from the sea. It grew until it covered the sky and poured forth a saving rainfall upon the earth. Holy Mother Church has always viewed this cloud as the prophetic announcement of the Blessed Virgin Mary, who was to bring forth the Savior. In his encyclical, Ad Diem Illum, Saint Pius X affirmed that "Mary was the object of the thought of Elias when he contemplated the cloud which rose from the sea." In 1247, Saint Albert, Patriarch of Jerusalem, gave a Rule to the "Brother Hermits of the Blessed Virgin Mary of Mount Carmel", which codified the form of the life they had spontaneously adopted. In the 15th Century, Blessed John Soreth instituted the Carmelite observance for women. 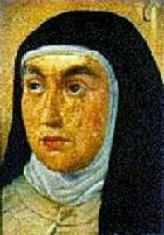 In the 16th century, Saint Teresa of Avila entered the Carmel of the Incarnation in Avila, Spain, where she lived for 20 years as a good religious. She became aware of the fact that the numerous travels the religious made outside the monastery and the long worldly conversation in the parlor were hindrances to the life of prayer. With a few companions, she resolved to return to the fundamental spirit of Carmel, the spirit of contemplation, and after many contradictions and sufferings, she founded the little Monastery of Saint Joseph of Avila. She extended the reform of Carmel to include the monks with the help of Saint John of the Cross, and spent the last years of her life traveling across Spain founding Carmels. She died October 4, 1582, at the age of 67, having founded 16 monasteries for nuns and 14 for monks. Discalced Carmelites lovingly refer to her as "Our Holy Mother Teresa". Saint Theresa of Avila, "Mother"
It is especially the Blessed Virgin Mary who is found across all the pages of the history of Carmel. The Order claims to have been founded in order to honor the Mother of God. Every Carmelite heart burns with a filial love for her and wills to imitate the hidden, silent life of the adoration of the Virgin of Nazareth. Saint Teresa of Avila says clearly that the desire of the Carmelite is "to be alone with the Alone". God reveals Himself to the heart in solitude, and therefore, each nun works alone, as much as possible, either in her cell or office. There is to be no speaking without necessity outside of the two daily recreations. The strict enclosure, walls and grates separate the religious from the world and help to promote and protect this solitude. A Carmelite’s day is centered on its summit, which is Mount Calvary —the Holy Sacrifice of the Mass. There, she offers herself with Christ to fulfill the Divine Will in all she will do during the day. At the foot of the Cross, and while reciting the Divine Office, she draws the graces and the strength she needs for her own sanctification and for all souls. Mental prayer is the cornerstone of Carmelite spirituality. Solitude, silence, detachment and mortification are the conditions of prayer and the negative aspect of the Carmelite spirituality, while prayer and union with God are its positive aspects. To be solid, prayer must be built on profound humility. Saint Teresa of Avila teaches that the essence of prayer is "not to think a lot, but to love a lot". Meditation and reasoning serve to prepare the soul to stay near Our Lord and speak to Him. The more a soul advances, the more this colloquy will occupy a greater part of prayer. The value of prayer is not measured by the sweetness that one might find in it, but by the fruit it bears of giving the soul a firm purpose in accomplishing the Will of God in everything, despite the repugnance of nature. Daily spiritual reading, reading during meals, weekly spiritual conferences, and an annual retreat furnish the common nourishment of the monastic life of prayer. The Rule imposes certain mortifications to help attain conformity to Christ. Saint Teresa told her daughters, "Do not forget that you are spouses of a crucified God". Though the Rule requires perpetual abstinence from meat, it does allow exceptions as a remedy for sickness or weakness. The fast of the Order from September 14th until Easter is less rigorous than that of the Church during Lent. This should not be frightening because nothing is asked in the Carmelite life which would surpass the normal strength of a young 20th-century girl. The Rule obliges common poverty (food, furniture, clothing, etc.) and personal poverty (no personal possessions). Linked to the profession of poverty is the necessity of manual labor. Carmelite nuns are seamstresses, embroiderers, gardeners, etc. Others apply themselves to painting, restorations of statues, bookbinding, making of liturgical vestments, as well as the necessary community works of cooking, cleaning and scrubbing. The vows of poverty and chastity express this renouncement of the world. Even during recreation, the nuns have some work to do by hand while relaxing and conversing in a family atmosphere. Carmelites strive to learn the way of humility and abnegation through prompt and joyful obedience to their superiors. Their least actions done out of obedience are united with those of Christ and can then acquire a very redemptive value for souls. The Rule recommends "Let all that you do be done in the Name of the Lord". Saint Teresa of Avila requires that aspirants have good health, good judgment and a solid nervous equilibrium in order to be able to support solitude and the regularity of monastic life. For six months (or more according to circumstances) after entering Carmel, the postulant lives the Carmelite life as all the other nuns. Upon vote of the Chapter, she is admitted to begin her novitiate by receiving the Holy Habit of Carmel. 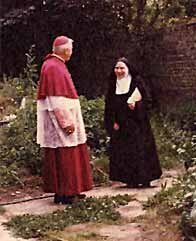 After two years, the novice may ask to be received, by vote of the Chapter, to make her temporary profession, which binds her to religion and the Order, by the three vows of Poverty, Chastity and Obedience. These vows are renewed at the end of each year over a period of six years. If a professed-novice realizes that she is unable to continue in the Order, she is free to leave at the expiration of her vows. The decisive step, by which a professed-novice becomes a Carmelite, is the Solemn Profession at which she pronounces her solemn perpetual vows. She then receives the black veil as a symbol of her consecration. Postulants are accepted between the ages of 18 to 30 years old preferably.